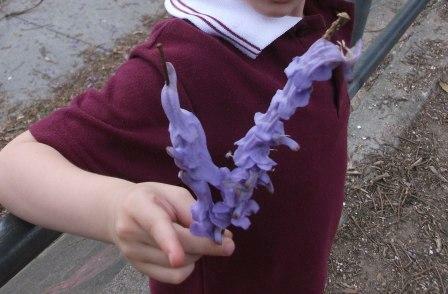 Today was one of those days when I stopped and thought “this is why I love my job.” As the children came into the clasroom this morning, one of my preppies presented me with some jacaranda blooms off her tree at home. 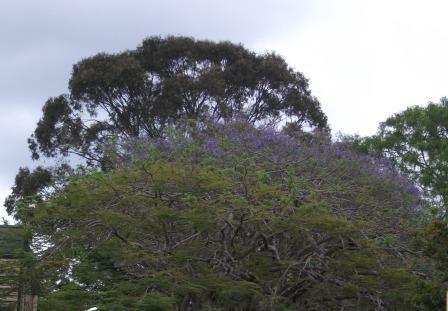 After roses, jacaranda’s are my favourite and I told my little friend that today, in honour of her gift, we would read the book “Purple Snow” by Eric Lobbecke. 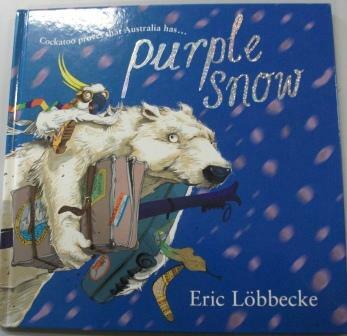 This beautifully illustrated book tells the story of a cockatoo who, whilst visiting the North Pole, compares the white snow on the ground to the purple carpet at home, created by the jacaranda blooms falling to the ground from the trees. 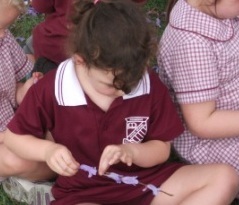 and threaded them onto their twigs. 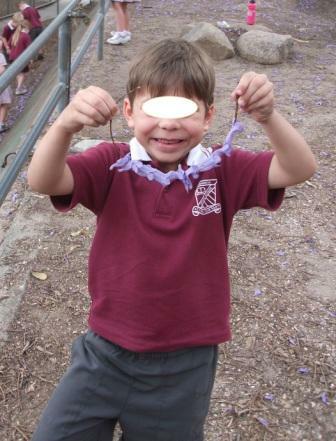 The children enjoyed exploring the different effects that were created as they threaded the flowers onto the twigs. Some were thin, some were thick and some were in a pattern. 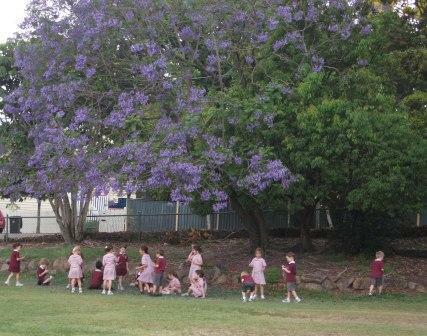 We were disappointed that, because of the busy nature of where this tree was situated, we couldn’t see the purple snow/carpet effect. 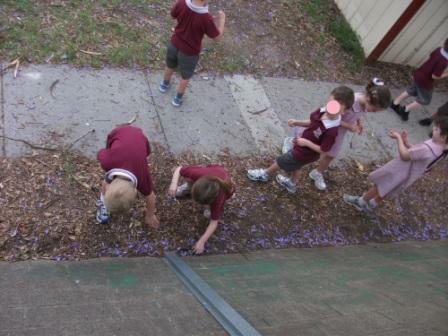 Some of the children said there were jacaranda trees on the edge of the oval and we should look there. 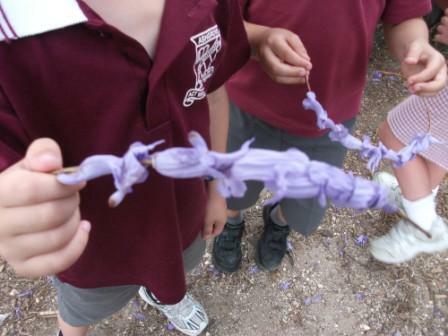 To our delight, from across the oval we saw purple snow and the children rushed across to get a closer look. 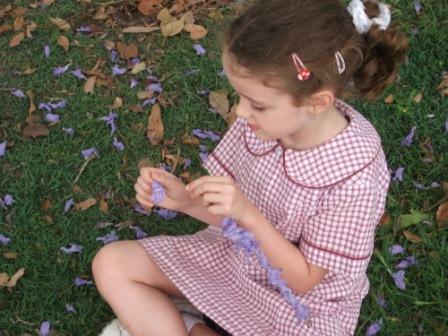 By the time I had caught up with them they were already settled on the grass under the trees threading flower twigs. It was at this time that I paused and took in the scene……..
enjoying the simpler pleasures of life. 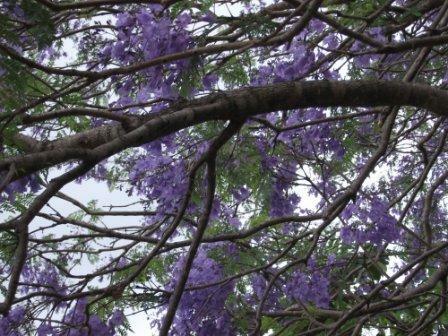 As well as threading we spent some time on our backs, lying on the grass looking up into the jacaranda trees. 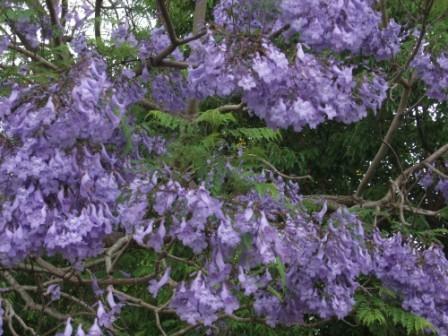 When a breeze blew, some of the blooms would fall gently from their branches, just like falling snow. 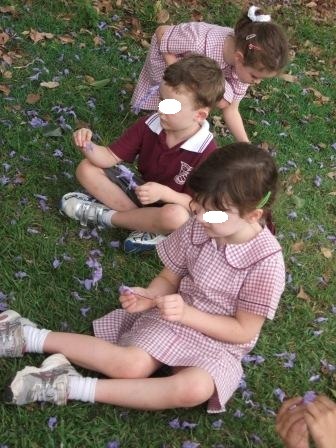 The children demonstrated quiet patience as they waited for purple snow to land on, or near them. Sadly, with the lunch bell about to ring it was time to return to our classroom. 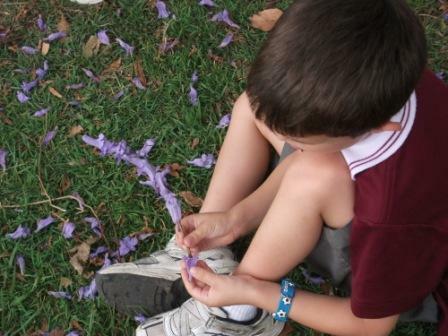 As we began to walk back across the oval the children noticed all the patches of clover in bloom and embraced the opportunity for some more simple childhood fun with a game of “what does this remind you of? 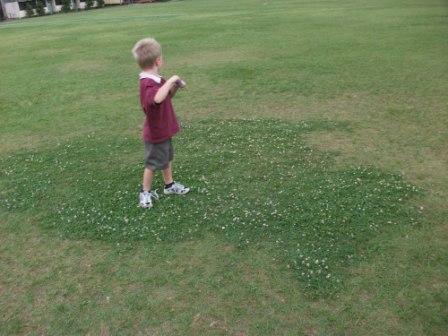 ” If you use your imagination this clover patch looks like a map of Australia! 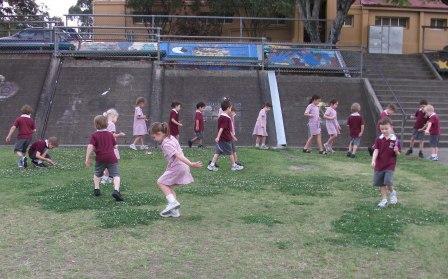 In another game the children made up and with rules known only to them, they had fun jumping from one clover patch to another. When we finally got back to the classroom and the children tenderly placed their threadings either on a table or in the vase with my original gift, I overheard them sharing our adventures with our Intern, a new Early Childhood Educator. As I listened to their happy chatter, I was reminded of one of the many reasons why our chosen profession is so joyful and rewarding…… the opportunity to not only relive childhood memories but to create them as well.